Description: The analysis of existent intrasystem hindrances is conducted in a cellular and methods of their indemnification. analytical expressions are received for estimation of noises level in a cellular. Sporyshev, K.A. 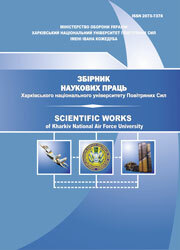 and Tkachev, A.M. (2007), “Vnutrisistemnye pomekhi v sotovoi sviazi”, Scientific Works of Kharkiv National Air Force University, Vol. 1(13), pp. 78-81.